It must be extremely frustrating to be a teacher in a public school system that relies on state and federal money to pay for its operations. This is because the government has imposed more and more controls on what is taught and how the schools are judged in the so-called achievement reached by the students. The George W. Bush "No Child Left Behind" program, modeled after a failed program he used when governor of Texas, literally forced teachers to abandon regular education programs and spend nearly all of their class time preparing students to pass government aptitude tests. If the students failed the tests, the teacher fell under the bus and federal funding to the school district was threatened. Consequently high school graduates during the eight-year realm of the Bush years in the White House learned very little about the world they live in, or how to prepare for living in it. 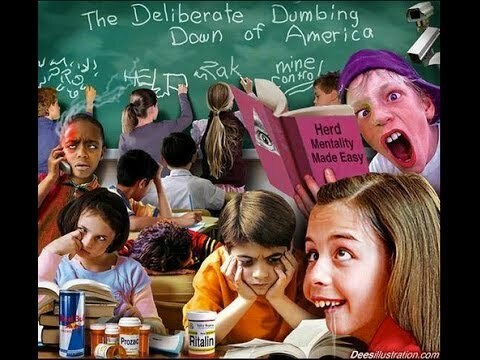 It amounted to an acceleration of a general dumbing down of the nation that has been going on for decades. Some years back, before many stores began using computerized cash registers that automatically calculated change in a transaction, we noticed that younger cashiers had difficulty making proper change. We had to watch the transactions closely because sometimes we were inadvertently overcharged. At other times we were given too much change. I came to the conclusion that these young men and women could not do simple mathematical calculations in their heads. There have been alarming news reports about random polls taken among people on the street that depict just how little people know and understand about their world. A speaker at an American university in 2012, who addressed students on the subject of the American Revolution, said he was shocked when one girl told him after his talk that she didn't know that the 13 original colonies were all located on the East Coast. Another street survey revealed that many people who were randomly questioned had no idea where Afghanistan is located. A National Report Card on history released in 2011 revealed that less than half of graduating high school seniors have a basic understanding of U.S. history and only about 17 percent finish high school with an understanding of U.S. history and government. Yet another report from the National Assessment of Educational Progress found that U.S. school children scored frighteningly low on history and social studies tests. The report said the students displayed "little understanding of key historical themes and the basic principles of American democracy." The studies have discovered that the same failure to understand the basic principles of American government and history reaches all the way into students in American colleges and universities. The National Council for Social Studies blames the Bush "No Child Left Behind" program for what is happening about the school students. Instead of knowledge, our schools appear to be training our children to be prepared for corporate employment. Without knowing the history and workings of their government, the graduates today are merely trained for general slavery on the open employment market. Some public schools are so financially strapped, due to dropping real estate values and subsequent loss in property tax receipts, that they are dropping subjects from their curriculum. Among the first to go are history and social studies. The schools seem to maintain public support to continue athletic programs, however. Notice that politicians are either equally ignorant of this nation's history, or they are purposely involved in rewriting history to suit their own purposes. Remember Sarah Palin's characterization of Paul Revere's midnight ride as a quest for gun rights? The Texas State Board of Education in 2010 adopted a controversial revision to the state's social studies and history curriculum that changed the teaching of the civil rights movement, religious freedoms, America's relationship with the United Nations and a broad range of other items. What is so troubling about the new Texas curriculum is that it is having an impact on school textbooks, which are mostly published in Texas and distributed to schools all over the United States. This is why our politicians can openly deliver false information about historical events and sometimes get away with it, thus confusing the minds of their followers. Fortunately some members of the media, like MSNBC's Rachel Maddow still know their history and are calling these characters on what they are saying. Unfortunately, a lot of right-wing conservatives remain glued to extremist "news" channels like Fox, and are going into the frey totally ignorant of what is happening to their brains and their country.